Another year of grace has come to a close. We would like to express our humble gratitude to each of you for your kind support in so many ways. intentions. We especially entrust your families and loved ones to the care and protection of the Holy Family of Nazareth. In that home, JESUS was the centre of life and MARY and JOSEPH loved Him and each other. Let us pray for peace in all families and the gift of renewed faith, hope and love! Holy New Year to All! In this Year for Priests we write to you from the cloister, joining the thoughts and prayers of each Sister like a tapestry woven with the golden thread of gratitude, esteem and sisterly concern. We thank the Holy Triune God through the Most Holy Virgin for the gift of your vocation to the ministerial Priesthood. Together with all cloistered, contemplative nuns around the world, we are united in prayer for you. May this year be a time of special blessings for you. This occasion makes us reflect on the goodness of priests who have shown such kindness and understanding through the years. We would like to greet in a special way all those who are ill, infirm, or serving in lonely mission areas. You hold a special place in the heart of our prayer. In this letter, we invite you to look to that holy place, the hill outside the city of Jerusalem where the supreme sacrifice of our Redemption was accomplished. There you will find the answer to every question and every need of your holy priesthood. To see the Father is to see Mercy: the Face of the Father is Mercy. hour – all that He had told them. The Cross is the book of Divine Love written for everyone! Pope Benedict XVI points out that the world has changed since St. John Mary Vianney lived out his priesthood in the small town of Ars. Indeed, in an atheistic media driven society, worldly powers and the presence of evil abound. Nevertheless, God is with us! He still calls each one to personal holiness. And what does this mean? It means at every moment and in all things to seek the Will of the Father as Christ Himself did. This is holiness. In the words of Vatican II: “A Priest’s personal holiness helps to make his own ministry more fruitful. Although the unworthiness in the priest is no obstacle to the flow of saving grace, it is nevertheless God’s way to work wonders of grace only through those who are more docile and sensitive to the inspiration and guidance of the Holy Spirit. These are the priests who through their union with Christ and their holiness of life are able to say with the Apostle: ‘I live. Yet not I live, but Christ lives in me.’” Look neither for honours nor for riches. Rather, imitate St. Thomas Aquinas. When Jesus asked him from the Cross: “What reward do you want, Thomas?” He replied: “Nothing but you Lord.” Daily walk in the way of holiness. It has been said: “The priest who is too busy to pray is busier than God wishes him to be.” Be reminded then that alone, you can do nothing, but incorporated into Christ, the true vine, you will bear fruit. May the Eucharistic Jesus be the center of your prayer, the secret of your life, the soul of your apostolic action. May your love for the Lord Jesus grow stronger with every Eucharist you celebrate through the gift of your priesthood. The love of Christ compelled him to preach at times with force, sometimes with tenderness yet always with a view to the eternal salvation of souls. You belong entirely to Jesus Christ always and everywhere. 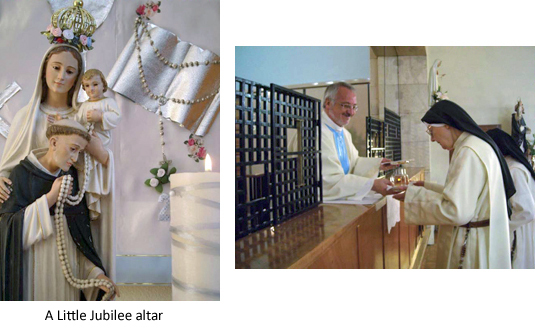 Wearing clerical clothing or your religious habit proclaims Christ to all who see you. This sign of consecration and witness to poverty is life-giving because it speaks of God to a world in deep need of Him! Unless you can be recognized as a Catholic priest, many will miss an opportunity of grace and possible reconciliation with God. These words addressed to St. John are meant for all but in a unique way to Christ’s own priests. To close this letter from Fatima, we entrust each of you to the Immaculate Heart of Mary. We recall Pope John Paul II who visited Fatima three times. His motto Totus Tuus All Yours O Mary! was the guiding light of his priesthood. preaching come as they pray the Rosary. The Beatification of Mother Mary Alphonsine Danil Ghattás, co-Foundress of the Congregation of the Rosary Sisters of Jerusalem will take place on November 22, 2009, Solemnity of Christ the King, in the Basilica of the Annunciation, Nazareth. adhesion to the Catholic faith. Around the year 1874 she felt called to start a religious congregation for native Arab girls for the promotion of the Rosary. The Congregation of the Rosary Sisters of Jerusalem was founded in July 1880 just two months after Fr. Damien Marie Saintourens founded the Dominican Nuns of the Perpetual Rosary (May 1880). we read: “Our Lady revealed herself to Mother Alphonsine in Palestine in as familiar a way as she did in Lourdes (France) and Fatima (Portugal). In 1995, the Congregation of the Rosary Sisters of Jerusalem was aggregated to the Dominican Order. Bl. Mother Mary Alphonsine, pray for us! On August 6, just as we finished praying the Little Hour of Terce, the Master of the Order arrived for a very fraternal visit. Fr. Carlos Azpiroz Costa was in Fatima to speak to the Dominican Youth International who were meeting here in those days. We were overjoyed and immensely grateful for the time Fr. Carlos so generously shared with us as we spoke of many things related to the Order and shared our favorite passages from St. Paul for the benefit of all. Father humbly took notes as is his custom. We thank God, Our Lady of the Rosary and Fr. Carlos for this fraternal visit and the graces received for our small Community here in Fatima. We also thank our Friends of Fatima for your prayers for the Youth Meeting which was a most prayerful, joyful and enriching experience for the more than 200 youth from 34 countries who attended. Please continue to pray for the young people. 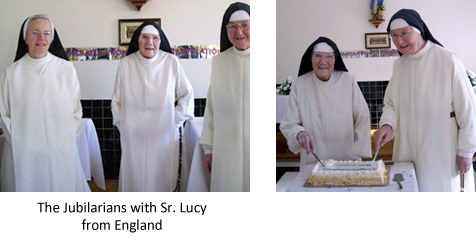 On October 14th two of our Sisters celebrated their 25th anniversary of entrance into the cloister. For our Community and especially for Sr. Mary Martin of the Blessed Sacrament and Sr. Mary Bernadette of Lourdes it was a day of grace, peace and joy. Holy Mass was concelebrated by seven priests Fr. Paul Kenny pastor of Our Lady of the Rosary Parish (Ireland) and a friend of Sr. Mary Bernadette presided. Family and friends from near and far joined in the celebration. Sr. Mary Martin was born in London and came to our Monastery by way of her mission work in Nigeria. Sr. Mary Bernadette was born in Dublin and while on pilgrimage to Fatima met the Sisters here and soon after decided to enter. “To You, O God, I will sing a new song. “…follow joyfully in Christ’s footsteps, moulding yourselves to His image and being obedient in all to the will of the Father. Do not be afraid to be saints! It is the best service you can offer to your brothers and sisters”. I shall speak to your heart so pure, Sovereign of the universe, and I shall offer my veneration from the depths of my soul. From the depths of my heart I shall greet your Immaculate Heart which, the first in this world, was worthy to receive the only Son of the Supreme God, coming forth from the bosom of the Father. Hail, singular shrine, that God has sanctified for Himself in the Holy Spirit. Hail, holy of holies, that the Sovereign Pontiff has consecrated by his ineffable entrance. Hail, ark of sanctification that contains the writing of the finger of God. Hail, urn of gold that contains the heavenly manna, filled with the delights of the angels. Hail, royal court, the true Solomon’s house of cedar, whose sweet fragrance surpasses all the woods of cedar. Hail, couch of gold, the most agreeable rest for the desirable beloved whose head is of perfect gold. Hail, room filled with a heavenly perfume, bringing the precious spices of all the virtues and graces. Hail, enclosed paradise, wherein the cunning seducer of Eve had never dared to crawl. Hail, sealed fountain, whose secrets the violator of hearts has never tasted, not even by the lightest sip. To whom do we compare you, to what do we assimilate the beatitude of your heart, O Mary? By what words do we worthily greet the intimate sweetness of your chaste breast? We encourage you to pray this Litany in loving reparation. Heart, after God’s own Heart, pray for us. Heart, in union with the Heart of Jesus, etc. Heart of Mary, comfort of the afflicted. In late September the Vatican announced that Pope Benedict XVI will visit Portugal in 2010 as a “pilgrim of Fatima”. As part of that pilgrimage the Holy Father will be present for the 12-13th of May, the feast of our Lady of Fatima. The Archbishop of Braga commenting on the upcoming visit said: “Our Lady, whom the Portuguese people love with special tenderness, is a kind Mother who invites us to delve deeper into Jesus Christ and the mystery of the Church.” It is hoped that this Papal visit will strengthen the already deep faith of the Portuguese and lead everyone to a more constant and reasoned witness to the Faith as part of the program of evangelization so needed in every country. We could now reply: He has indeed come to Fatima! Pope Paul VI (1967); Pope John Paul II (1982, 1991, 2000) came in person. Prior to these visits Pope Pius XII had addressed pilgrims to Fatima from Rome and he had sent his papal legate in 1947. Pope John Paul I as Cardinal Luciano visited Fatima and spoke at length with Sr. Lucia in Coimbra. Pope John XXIII as Cardinal Roncali also visited Fatima. Cardinal Ratzinger, now Pope Benedict XVI also visited in 1996. The prayers of Bl. Jacinta are heard! On 28 October, after a prolonged illness, Fr. Louis Kondor, Vice-Postulator of Bl. Francisco and Jacinta, entered eternal life. With so many others our gratitude to Father is unbounded. The idea for our bulletin Friends of Fatima owes its origin to Fr. Kondor. As a child he wished to be a priest. At age 18 he entered the seminary of the Divine Word Missionaries in his native Hungary. In 1949, when the invasion of Hungary was imminent the young seminarian was sent by his superiors to Austria. Eighteen months later he was again ordered to flee as the Russians began to invade Austria. He fled to Germany where he was ordained 28 August 1953. In 1954 Fr. Kondor was sent to Fatima to serve as vice-prefect of the large Divine Word seminary here. In 1960, while assisting Bishop John Venancio he was given responsibility for the Cause of Beatification of the Little Shepherds of Fatima. As he himself said it seemed an impossible task since some “experts” had declared that little children could not attain to the degree of sanctity necessary for the Church to declare them Saints. For Fr. Kondor, with the help of Our Lady, the mission became possible! After 40 years of intense labour the Process of Beatification was completed. Pope John Paul II came to Fatima on 13 May 2000 to Beatify Bl. Francisco and Bl. Jacinta. It was the Year of the Great Jubilee! to suffer and his zeal for souls. His whole life was anchored and enfolded in the mystery of the Incarnation of the Divine Word. This mission of preaching – of first witnessing to Christ by our very life – is the duty of every baptized person according to his or her state of life in loving obedience to the Will of the Father. It’s important to renew our knowledge and understanding of Baptism. The Catechism is a good source. The entire volume is published on the internet at www.usccb.org/catechism/text. Hail Mary, full of grace, pray for us and make us holy preachers of grace! Thank you so much for being faithful to your Rosary Hour of Guard. We are happy to say that this year we have enrolled many new members. Throngs of pilgrims came to Fatima in 2009 though there was a noticeable decline in visitors from some countries. Much is said of the global crisis of economy. But the crisis not mentioned in the media is the crisis of hunger, deep spiritual hunger and thirst for God which pervades the world today. Tensions and anxieties seem to afflict everyone. What is the answer? We must pray and renew our consecration to Our Lady’s Immaculate Heart. In times of crisis to whom does the humble child turn? He turns to his Mother. He speaks to his Mother, abandons himself to his Mother. Take up your Rosary anew each day. Renew your confidence in the promise of Our Lady, which is the promise of God, to be near you to help guide you and to protect you on every step of life’s journey. Be ready, dear Rosarians to show mercy to those who hurt or injure you. Pray for them and ask God’s mercy for them. In this way you will not lose the peace of Christ Who dwells in your heart. Sometimes it is not easy to forget even though we have forgiven. But we can remember with mercy. To strengthen your own confidence in the Rosary we relate one incident in the life of Mother Mary Alphonsine. There are many more! A young girl, Nazira had fallen into a well. While the onlookers let down a rope with no success “Sister Mary Alphonsine hastened to the chapel with the children and prayed before the Blessed Sacrament. Then she went back to the cistern with her Rosary in her hands, … and threw her long Rosary …into the well, crying; “O Queen of the Holy Rosary, save her and help us in our great distress!” The onlookers laughed scornfully, saying; “The little one is dead; she has been an hour in the well.” But Sister Mary Alphonsine was not disconcerted. She went back to the chapel and began again to say the Rosary with the children. Meanwhile Sister Catherine stayed by the cistern and let a bucket down to the bottom of the well…The rope suddenly jerked ….With the help of an Arab, the Sister drew up the bucket and a head appeared at the surface of the water. With renewed courage they pulled and pulled and there was Nazira standing upright in the bucket, with the Rosary around her arm. I was in the water, I felt the Rosary fall on me, I opened my eyes and saw the cistern shining with a bright light. I felt as comfortable in the water as if I had been in bed. Sister Catherine hurried to the chapel and told Sister Mary Alphonsine what had happened. May you have a Blessed Rosary Christmas!